Kubota Australia are proud to be long-standing partners of Krone hay & silage equipment. Based in Germany, Krone has been manufacturing equipment for over 100 years. 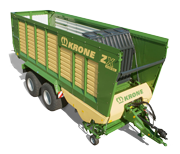 Manufacturing modern hay & silage equipment to the highest standards, Krone is committed to the research of new innovations and technologies, producing products that are highly sought after for their exceptional quality, performance and efficiency. Built to withstand Australia’s tough conditions, Krone’s market leading range extends to mowers, tedders, rakes, round balers, big square balers and forage wagons.